Abelia is a flowering perennial shrub that throws sweetly fragrant white and pink blooms throughout the summer and fall. Abelia's glossy semi-evergreen foliage makes a dramatic backdrop to the blooms, and changes from rich green to bronze in the fall creating winter interest. Hardy in USDA zones 6 though 9, abelia thrives in full sun to partial shade exposures and will grow well in a woodland garden with at least some dappled sunlight. It is very low maintenance and requires little and infrequent pruning. Hard prune your abelia in the spring if needed after the last hard frost. Cut away any damaged or potentially diseased branches. Look for any branches that cross or abrade one another, and prune them to prevent the invitation of disease and pests to a wound site in the cambium. Though abelia rarely requires pruning, overgrown or misshapen shrubs can be pruned of up to one-third of their bulk to create a new architecture for the plant. Bloom performance in that current season will be affected, but the shrub will recover for bloom the following season. Maintenance prune your abelia lightly as needed throughout the growing season. Routinely inspect for and remove damaged or diseased foliage and lingering spent blooms. 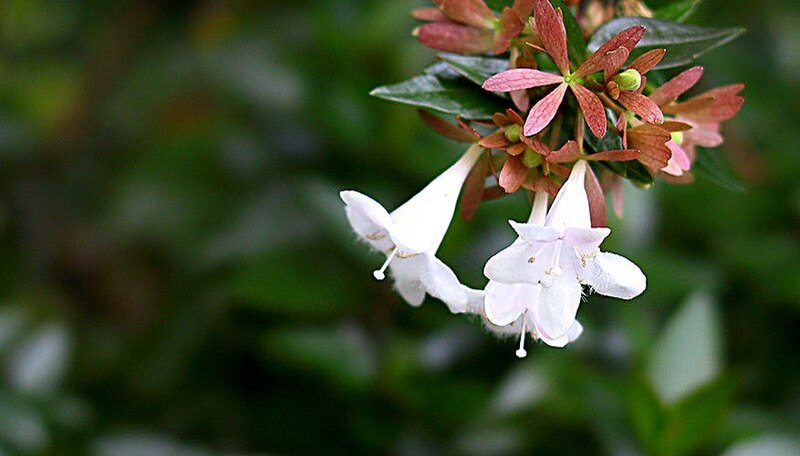 Abelia blossoms are long lasting and when they fade tend to fall easily off the plants in a self-cleaning fashion. Any blooms that are stuck on the plant foliage can simply be plucked off or brushed away with your hand to maintain a neat appearance. Water and feed your abelia to minimize the shock after pruning. Keep the soil at the roots evenly moist at all times. Fertilize your abelia in the spring before the buds break open with a good quality general purpose and water soluble fertilizer, such as MiracleGro. Apply according to the manufacturers dosing instructions over pre-watered soil to prevent burn and speed nutrient uptake.